I made this giant heart cookie for the first time believe it not. I’m impressed it came out really great. It’s even kind of healthy; it’s gluten free. It’s a Pillsbury brand package that was given to me. Not often I get those because I like to make cookies from scratch. It sure made it easy though to make! Spray your heart pan with a cooking spray. Just take dough out of the container and press it into the pan evenly, Bake at 350 for about 15-20 minutes. Let it cool ½ hour or so then take a butter knife and go around the edge to loosen it. When you see that it’s loose; then turn the pan upside down and it will slip right out. The heart pan was my Mom’s. I haven’t used it in quite a long time. I remember how she use to make hearts cakes with it. The ideas are endless on how you might want to decorate the top. You could frost it with messages or around the edges. You could use heart candies with those cute messages on them. I used Valentine M & M’s to make a message that says I love you. What a surprise this will make for your significant other for Valentine’s Day. I know mine will be surprised! In large bowl, beat sugars, butter and vanilla with electric mixer on low speed until well blended. In a medium bowl, stir rice flour, xanthan gum, baking powder, baking soda and salt until thoroughly blended. On ungreased cookie sheets, drop dough by tablespoonfuls about 2 inches apart. Bake for 7 to 9 minutes or until light brown. Cool 1 to 2 minutes then remove from cookie sheets to cooling racks. Even though the cookie I made is from a package; I do have a recipe to share from Betty Crocker that is similar. It's a Gluten Free Chocolate Chip Cookie Recipe. 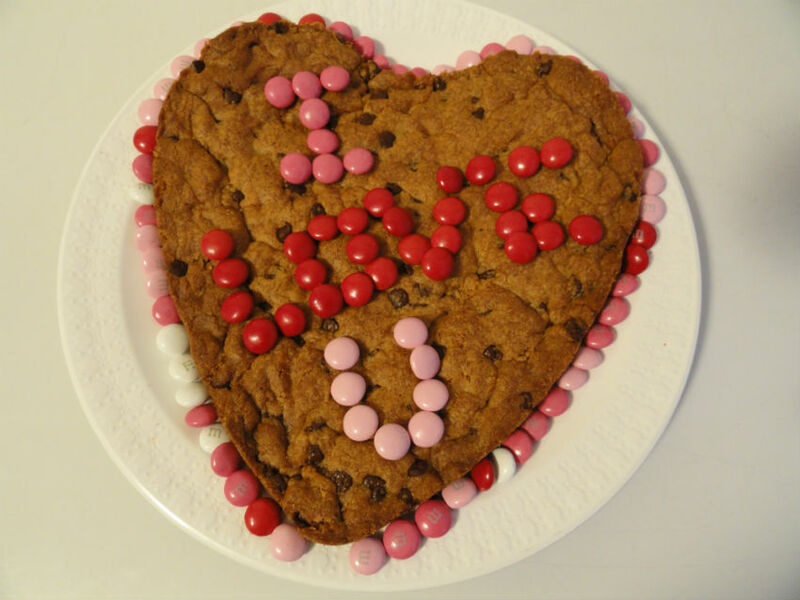 You can make this the original cookie style or one big cookie heart cookie for Valentine's Day.